is, by virtue of his own act, under any acknowledgment of allegiance, obedience or adherence to a foreign Power or State;.. This restriction raises a number of interesting questions about what it means to be a Jamaican citizen. Most commentators have seen this as an issue related to dual citizenship, and I do too. A person who was born outside of Jamaica before August 6, 1962 and whose father or mother would have become a citizen of Jamaica on August 6, 1962 automatically became a Jamaican citizen. See Section 3A of the Jamaican Constitution. A person who is married to a Jamaican citizen is entitled to be registered as a Jamaican citizen, regardless of his prior citizenship. See Sections 4 and 7 of the Jamaican Constitution. Every person born in Jamaica after August 5, 1962 is entitled to Jamaican citizenship, regardless of whether he/she is entitled to the citizenship of any other country. See Section 5 of the Jamaican Constitution. A person born outside of Jamaica after August 5, 1962 is entitled to Jamaican citizenship if his father or mother was born in Jamaica. See Section 6 of the Jamaican Constitution. Many of the countries to which Jamaicans have emigrated also recognize dual citizenship, namely Canada, the UK, USA. Many Jamaicans who emigrated have done nothing to change their nationality or citizenship from just being Jamaican, even though they have the option for dual citizenship. Many Jamaicans who emigrated took the opportunity to acquire a second citizenship in their host country for a range of reasons. I do not have figures on either group, but it would be interesting to see what the numbers are. Let us simplify by saying that some of those who obtained dual citizenship have also returned to Jamaica and have the right to vote; again, I have no figures for this group. However, if you can vote as a dual citizen, why does the Constitution make the distinction it does when it comes to holding a position as a Senator or in the House of Representatives? If there is some concern that those with dual citizenship will somehow serve their constituents and country less than those with only Jamaican citizenship, then take away their right to stand for election completely. Why waste time? But if that is the belief, then also do not let those who are dual citizens vote. Returning residents are being sought and more outreach is being made toward the Diaspora; many of both groups may have dual citizenship and have very strong desires to help Jamaica. But for that overtures to them to make sense then the dual citizenship issue needs to be rethought. There are also Jamaicans who live abroad who have never obtained dual citizenship but have lost their rights to vote in Jamaican elections. When this issue has been brought up, the general impression I have is that politicians in Jamaica do not want to extend the right to vote to all “Jamaicans” outside the country. I can understand partly this resistance, because in many ways it can complicate the election arithmetic, not least by greatly expanding the electorate, but also giving votes to a body of people who largely do not then reside in the country and have to deal with the immediate consequences of their voting behaviour. Other countries that have given the right to overseas voters tend to be much larger, and their overseas population does not tend to be greater that the population within country. Many Caribbean countries, by contrast, have overseas citizens whose numbers could be close to or greater than the home population. I think the issue of citizenship and eligibility for political office needs to be rethought, not least to reflect some aspects of current realities. The Parliamentary elections, which were held on September 3, have left the country in yet more confusion. The initial results gave JLP a 31-29 seat victory over incumbent PNP, but the PM has not accepted these results and requested recounts. Director of Elections, Danville Walker, said the official recount begins at 9 o’clock this morning. There is every likelihood that the election results will not known for some time and there may be legal proceedings regarding candidates in some constituencies. There are reports of electoral irregularities, which will complicate reaching final results. Amongst these, PM Simpson-Miller had alleged that some members of the JLP had sworn allegiance to foreign powers which, if true, may make them ineligible to hold seats in the House of Representatives; she also alleged JLP campaigning the day before elections (which is illegal) and vote buying. A good blog to look at, Jamaican Lifestyle (see link) is providing some very interesting insights into Jamaican politics, and its economic and social life. I recommend it for keeping abreast of the election developments. Also worth a read is the lead article in today’s Gleaner (see link). The various surveys had indicated that the election would be close, with JLP having a slight lead, and indications are that PNP suffered the aftermath of Hurricane Dean, with the slow process of relief and repair hitting its image in the public mind. And so it has proved, in what has been the closest election in terms of seats since Jamaica gained universal suffrage in 1944. The Electoral Office of Jamaica said yesterday’s voter turnout was a modest 60.40 per cent. Politcally motivated violence seems to have reared its ugly head in the days leading up to voting and on voting day itself. Whatever the final outcome of the voting, this election will give much food for thought to both sides. What a difference a day makes: Where now Jamaica? Jamaica was sailing along towards elections on August 27. Opinion pollsters and ordinary citizens were making their calculations about who would come out ahead on voting day. The various debates between PNP and JLP heavy weights, culminating in the debate between PM Portia Simpson-Miller and JLP leader, Hugh Golding, seemed to have given JLP an edge heading towards the last week. Then, buddum! Nature, who has no votes, but often can be critical in how things turn out, wanted to have its say. A hurricane of enormous proportions started its way across up the string of Caribbean islands, with its eye set on Jamaica. Fast forward. The eye passed the island by, but there was still a devastating impact on several parts of the country. But, outside the concerns of meterologists, the hurricane had changed more than the physical landscape of Jamaica. The electoral landscape was dramatically changed, and now is in a sea of uncertainty. It is essential that this emergency comes to an end immediately. The security forces are clearly on top of the situation. There is no threat to law and order. There is nothing “likely to endanger the public safety or to deprive the community, or any substantial portion of the community, of supplies or services essential to life”. No justification for prolonging the emergency beyond today exists. It must come to an end now. The PM said that she did consult with the opposition, so wont accept any accusations that she sewed disunity in the nation, and is having no hesitation continuing with the state of emergency. Meanwhile, a certain confusion has set in about the date of the election. August 27 could not work, not least because the security services and poll workers could not vote this week, as previously expected. News came out that the Electoral Commission had proposed September 3 and that this had been accepted by the Governor General, and that date seemed agreed as a spokesperson for the Ministry of Education and Youth announced that schools would not reopen that day but on September 10, acknowledging that many schools also act as voting stations. (If the original date chosen had been a play on 7, how could a play on 3s and 9s–with their very different spiritual significance–work?) Cabinet met in emergency session on August 21 to consider a recommendataion that the elections be postponed from August 27 to September 3 and that members of the security forces go to the polls on August 28, one week later than the August 21 date that was first set. But the PM in a national address on August 22, made no mention of a date for the election. So what now? Part of the confusion is a result of a protocol mix up. The Electoral Commmission should have put its recommendation to Cabinet before handing it to the Governor General. That should be easy to overcome, and presumably is a lesson for the future. 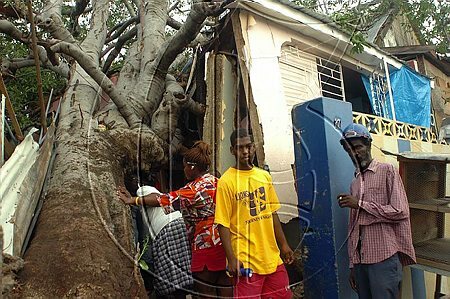 Not surprisingly, there are those who feel that more time will help PNP to get the benefits of the hurricane in terms of largesse that will start to flow in terms of dealing with the damage. But, some believe that the continued state of emergency will be a bigger negative than any positive from the largesse, so while that stays in place it will hurt PNP’s chances. While tourism seems to have been able to escaped major damage, that has not stopped a rapid campaign to reassure foreigners that “Jamaica is open”. The country’s agricultural sector took a big hit, especially bananas. That could factor into fears about economic prospects, at least in some areas in the short run. Rehabilatiton needs will create some possibilities for jobs and some patching up that might sway some but it’s hard to see that this will really matter much to anybody who has had years without something basic like a good road or other social service. In the meantime, the Jamaica Power Service seems to be drawing back from any promises about when it can get power back to most of the island, and until that occurs, it hard to see (sorry for the pun) how the right conditions exist for holding elections. So, for at least a while the country is really stumbling in the dark and more than a little confused. My own naive opining had been that the longer the time between announcement and election, the worse the situation for PNP: under the British-sytle parliamentary system incumbents are not usually helped by delay. Now, there is confusion and that delay could be good or bad, but much will rest on what is really done with that time. It could be a bumpy few weeks ahead. I have focused my attention on my other blog (Living in Barbados), and the need to pay attention to preparations for Hurricane Dean as it approached Barbados, quickly turned to concern for my family in Jamaica as Dean moved on with greater ferocity towards that island. Gladly, the eye of the storm stayed offshore, but the island still got a beating. Relatives to whom I have spoken today (in Mandeville and Kingston [UWI Hospital) report a heavy battering by rain, with less wind effects. Worst hit areas appear to be those closer to the coasts, with the hurricane taking its toll on trees, but creating less property damage than if the full brunt of the storm had hit the island. I have not heard from relatives in St. Mary, where I hear that fixed phone lines are still down and I have not been able to reach anyone there by cell phone. The Gleaner is keeping a useful hurricane blog going of developments on the island (from where the photo graph is taken), using a range of their reporters. Bloggers in Barbados have kept a good watch on developments further north, so it’ s worth checking their sites (Barbados Free Press, Barbados Underground, Notes from the Margin) as well as the well-established news (such as CNN, BBC) and weather websites (such as the Weather Channel). The worst of the present hurricane seems to have passed the Caribbean islands and now heads towards Mexico and the Yucatan peninsula. Hurricane Dean will make for an interesting few days ahead as Jamaica prepares for elections on August 27. The physical conditions of the country and the need to get things back to normal could make it very difficult to hold elections on that date, but we await further decisions by the Election Commission. During June 19-21, in Washington, DC, Caribbean leaders, academics, activists, entrepreneurs, and others will mingle with members of the US government, representatives of international and regional financial institutions, and others with an interest in the region (see link). There will be two side forums on private sector development and the Diaspora. The Caribbean region has many issues to face. Whether politicians see the issues in the same way as their populations is not clear, but the democratic process will be a guide as elections come along later this year. To me there are several thorny problems that could derail the region’s vision for itself. First, is the burr of intraregional trade. It has been clear for some time that each Caribbean nation does not view neutrally the arrival of investors from another country. I will cite just the recent reaction in Barbados to the proposed take over by Trinidad’s Neal and Massy of Barbados Shipping and Trading. Generally, people don’t see these moves as strengthening the region’s ability to compete in a broad international environment, but merely as the loss of an important national player to a foreign entity, and as such a bad thing. The economic and financial explanations of possible merits rarely sink into most people’s minds. It is little different, when we consider the movement of labour between the countries. The movement of skilled or other workers from the larger countries (Guyana, Trinidad, and Jamaica) is often seen negatively in the smaller countries such as Barbados. And these movements quickly get tinged with emotive and racist language, citing themes such as “invasions” and “aggressiveness”. So, what future for regional intiatives such as CSME? There does not seem a readiness to share a common economic space, especially if it means an influx from poorer, more violent, and apparently less stable countries in the region. Related to this is the prickly question of regional air travel. The region may not really be able to support its own stock of air operators. We have seen the demise of Caribbean Airlines. The merger of Liat-Caribbean Star is underway. Air Jamaica’s future has been called into question, not least by the recent selling of its Kingston-London route to Virgin Airways. The other problem is the high cost of travel within the region, with its related negative impact on tourism. Liat-Caribbean Star charges too much for travelling short distances within the region: the Secretary General of the Caribbean Tourism Organization Vincent Vanderpool-Wallance, has recently called these high fares the “silent killer” of regional tourism. The fact that some of the shareholders (Antigua, Barbados, St. Vincent) in the regional airline also own their main airports, puts a contradictory twist to how to price for international travel, given that the airport investment needs to be recouped. St. Lucia’s government has recently announced that it will no longer finance Liat, and has contracted with American Airlines to provide services between St. Lucia and Barbados. A little friction between the governments over these moves will be no surprise! A complex and growing issue is the relationship with China. This has the double dimension of which “China” countries decide to work with. Some Caribbean countries are for a “one China” policy and are building deeper relations with the People’s Republic (see Barbados’ PM’s recent visit to Beijing, for example). Others do not wish to follow that road and are deeping relations with Taiwan (see St. Lucia, for example). Some (like St. Lucia) seem to switch with a change of government (see article in Broad Street Journal). The People’s Republic of China has an interesting position at present. It is a member of the Caribbean Development Bank (see link), with its own Director and seat on the Board of Governors. It is becoming a major source of financing in the region, especially of prestige construction projects (such as stadiums and highways). The People’s Republic of China is taking a fast-extending role in the development of poorer countries worldwide (especially in Africa, where this help can also mean access to valuable primary commodities), and has the resources to fulfill this role. It has also become an important source of labour to the Caribbean to help with construction projects. But this latter aspect is coming at a price as local opinion quickly turns hostile when it seems that local labour is being pushed to the side (whether due to proper procedure of suspected underhand dealings). Whether local labour has the skills to compete well against Chinese workers, it is often hard to compete with Chinese companies on price: anecdotal stories of Chinese workers getting US10 a day and having to rumage around to find food and live in what are seen as squalid conditions do nothing to enhance the image of the Chinese worker. The presence of Chinese workers and contractors is not a singular problem in the Caribbean, but part of the emerging impact that the People’s Republic is having on economic developments. It is becoming the dominant international force. Mix this with the pre-existing sense of invasion from foreigners that some are feeling and one does not have to look far to see an unhappy road ahead if somehow the apparent large influx of Chinese workers is not controlled, especially in the smaller islands. The politicians and others will have more than these issues to think and talk about and I will try to see if some of these reflections can be quickly incorporated into this blog. Many would have hoped that the Cricket World Cup would have provided a wonderful platform to showcase what the region can do. Yet, we have seen a tournament that had so many missteps that it is hard to believe that the region’s image has not been tarnished. Whatever legacy benefits may be expected, at the current time, these would seem to be distant promises. The world will not really be able to distinguish whether the conduct of the tournament was due to the role of local organizing committees, or to the role of the International Cricket Council. The world is not so interest in cricket to dig deep to know the real reasons. It will simply see the Caribbean as “not being able”. The IMF’s latest assessment of Jamaica’s economic performance is very positive (see http://www.imf.org/external/pubs/ft/scr/2007/cr07152.pdf). It notes that the economy registered its best growth for nearly a decade, at just under 3% in FY 2006-7. Equally significant, prices rose by 6 1/2% in FY 2006-7, compared to a recent high of 19% in September 2005. The improvement in agricultural activity helped in both cases. The current account of the balance of payments also improved, helped by increased tourist receipts and remittances. With the help of capital inflows, net international reserves reached historically high levels, at just about US$ 2.3 billion. This week, the World Bank in collaboration with the United Nations Office on Drugs and Crime produced a report entitled “Crime, Violence, and Development: Trends, Costs, and Policy Options in the Caribbean” (see document crimeandviolenceinthecaribbeanfullreport1.pdf). It details and quantifies some of the startlingly terrifying statistics about violent crime in the region, and notes that the solutions are not to be gained from national actions, but need international efforts, especially from the United States of America, from where most of the guns come, and to where most of the drugs traded through the region go.